Since you all enjoyed the 1 shirt, four ways post from last week (if you missed it, you can check it out here), I thought I would begin sharing more ways to style staple items we all keep in our closets. I think one of the biggest issues I face is feeling like you have a closet full of clothes, but nothing to wear and while shopping is great and all, the normal everyday girl can’t be buying new stuff left and right. So, why not find new and creative ways to take what we already own and get a fresh look? So, today, I am talking about a very common staple item and that is the everyday cardigan. You can use any style of cardigan, long or short, but today’s focus will be on a shorter style. 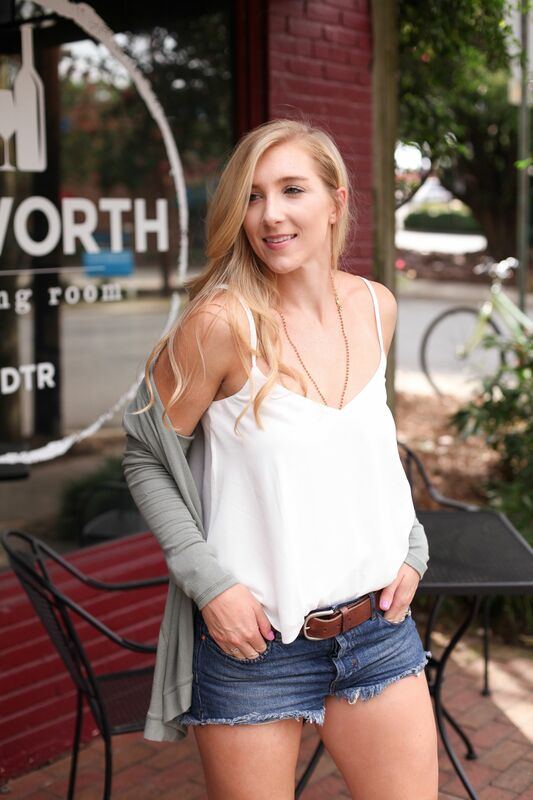 The one thing I like about a cardigan is that you can really throw it on with anything – jeans, shorts, dress, etc. 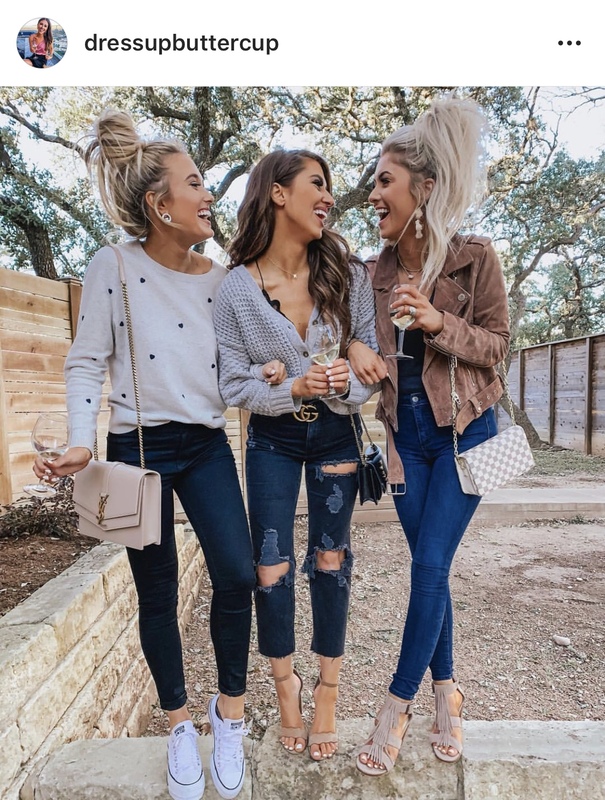 Alright, since we all need the inspiration (trust me guys, I struggle too), I have picked looks from some of my favorite fellow blogger girls that look SO good in a simple cardigan. First up, is Dede Raad from Dress Up Buttercup . 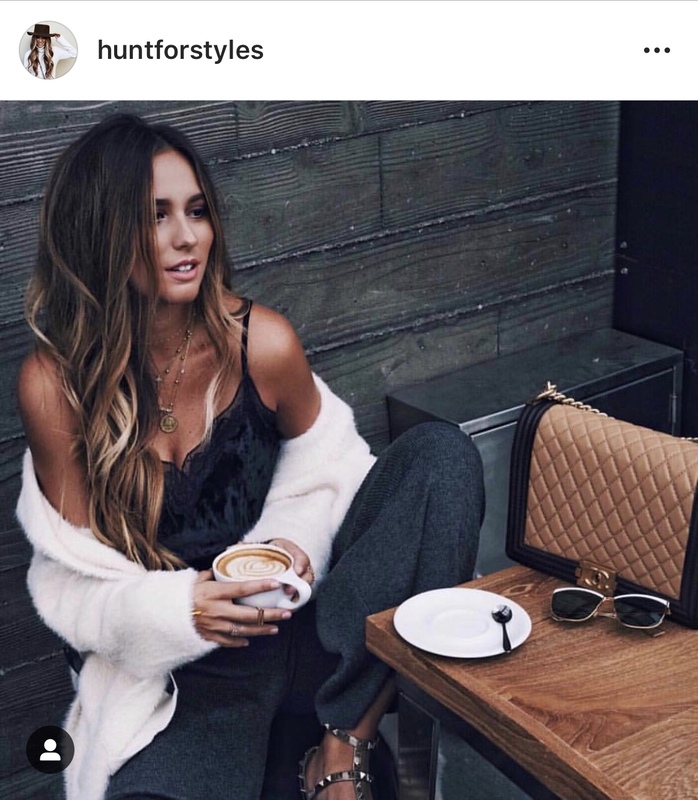 In this photo, I love how she styled this adorable cardigan by tucking it in and pairing it with a cute bralette. I definitely have not seen anything else like this and thought it was such a unique idea! If you would like to shop Dede’s look, you can do so here. Just click on the picture of this photo! Next, is Grace White from A Southern Drawl. 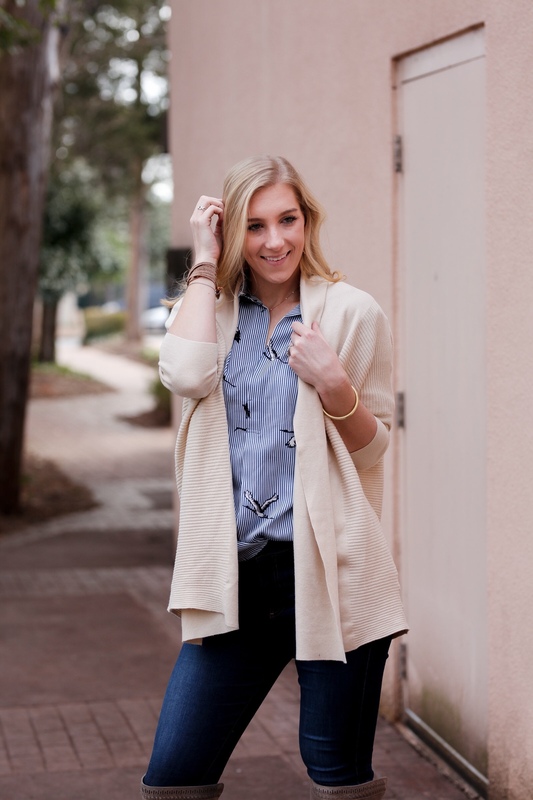 Here Grace has styled a simple cardigan very casually with jeans, a casual belt, and simple tee. I love how she dressed it up with a pretty necklace and classic clutch. This outfit would be so simple to re-create with items in your own closet, which makes it one of my favorites. You can shop this look of her’s here. Third, is Gina Eldahmy with Hunt for Styles in this comfy casual look. I love how she styled this sweater with a pair of comfy sweat pants. Definitely a girl after my own heart! I also love that, while she is wearing sweat pants, she made it look street style appropriate by styling it with a pretty tank and cute shoes. In this way, the look is made more flirty and comfy. Fourth, is Emily Herren of Champagne and Chanel. 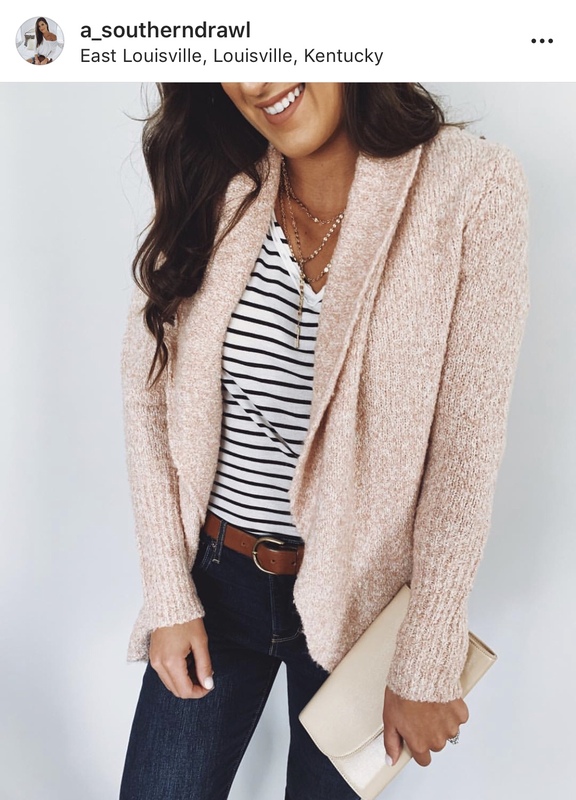 In this photo, Emily styles her cardigan simply and effortlessly. I think this is the perfect look for running errands around town, grabbing coffee with a friend, or for a casual weekend. You can shop her look here. Fifth, we have Courtney Sheilds Alrbright with Bring your Own Beauty. 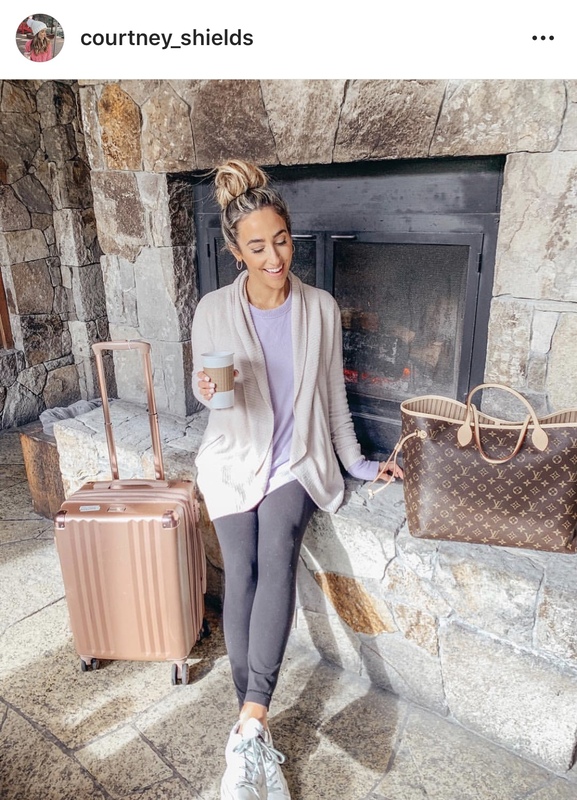 In this photo she is about to head for a flight and I have to agree that it is the perfect travel look. I also think this would be great for a casual weekend at home, running errands, or even a casual lunch. You can shop her look here by clicking on this photo. Lastly, here are a few of my own looks with cardigans I thought you might enjoy!